In 1920 Louise Pearce (1885-1959) traveled to the Belgian Congo (now Democratic Republic of the Congo) to field test a new drug against trypanosomiasis, or African sleeping sickness. This fatal disease, caused by a blood parasite, was epidemic. Working in a clinic in the country's capital, Pearce developed a protocol for testing the drug's safety, effectiveness, and optimum dosage. Called Tryparsamide, the new treatment cured about 80 percent of patients, although high doses given for severe cases had the side effect of partial or complete loss of vision. This achievement received immediate international recognition. For decades Tryparsamide remained the standard treatment for trypanosomiasis. Tryparsimide was derived from arsenic. In 1909 Paul Ehrlich, in Germany, had developed an arsenic-derived drug called Salvarsan, which was the first effective treatment for syphilis. Since Ehrlich had also found that related arsenic compounds could kill trypanosomes, Simon Flexner, director of the Rockefeller Institute, directed two chemists, Walter Jacobs and Michael Heidelberger, to develop new arsenic formulations for treating trypanosomiasis in humans. 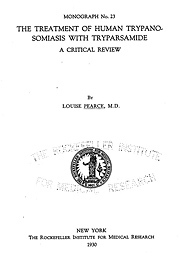 Flexner enlisted two members of his own laboratory, Wade Hampton Brown and Louise Pearce, to study the disease, and test the experimental drugs, in animal models. When the four scientists determined that Tryparsamide was the most promising drug, Pearce traveled to Africa to conduct human trials. Louise Pearce received the AB from Stanford University in 1907 and the MD from the Johns Hopkins University School of Medicine in 1912. 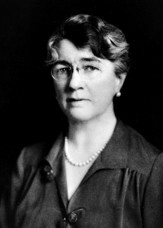 That year she took a research position at the Rockefeller Institute under Simon Flexner, the Institute's director, and she was promoted to associate member in 1923. Pearce remained at Rockefeller the rest of her career. Much of her work was devoted to developing animal models for the study of human cancers. Of the researchers involved in developing Tryparsamide, Pearce was the most celebrated: she was awarded the Belgian Order of the Crown in 1921 and the King Leopold II Prize in 1953. The recipient of many additional awards and honorary degrees, Pearce also served as president of the Women's Medical College of Pennsylvania from 1946 to 1951.